In previous years, our organization has carried out missions and events in all parts of the country, especially in tension areas, an important supportive activity in several fields. 1. Emergency and medical care, dozens of paramedics and physicians from the organization were deployed in the areas of conflict and provided initial solutions to the injured during the first minutes thanks to their medical equipment, professional experience and rapid arrival. –	Over 500 treatments during Operation “Protective Edge”. 2. Psychological and physical support for the besieged population in shelters – dozens of volunteers visited and supported hundreds of people in shelters, as well as at homes of hundreds of elderly people, in order to support them emotionally and bring them basic necessities (most of them are afraid to go out to the store due to shooting in their area). –	3500 food baskets distributed. 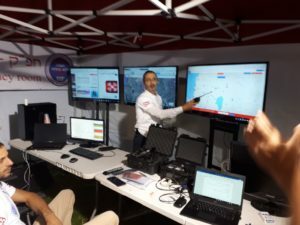 –	52 shelters supported by us. –	1500 children taken for recreation in quiet and calm areas. 3. Moral and physical support for IDF soldiers: hundreds of gift packages, underwear, basic materials, headlights, knee pads and other aids were distributed to thousands of soldiers in accordance with the needs specified by their commanders in the field. In order to coordinate all this emergency activity, we established Tactical Headquarters staffed by volunteers (professionals) to coordinate the needs in one place, in conjunction with the authorities and citizens. The Tactical Headquarters is a portable command center equipped with all the advanced means of communication that allow managing events even during wartime. Due to the recent events in Israel, and following the establishment of our Tactical Headquarters in the northern region as a result of the of the uncertainty in the area, we were asked to set up another command center the southern region due to the increasing level of danger in that area as well.